Welcome to #FitReaders!! 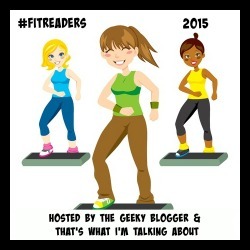 Felicia the Geeky Blogger and I are super excited to be co-hosting this fitness-oriented group during 2015. For the rest of 2015 (October – December), I will be hosting the official check-ins. This is my weekly check-in post where I share about my week, and I hope you share about yours as well. There will be a check-in on December 25th (the last one of 2015!). 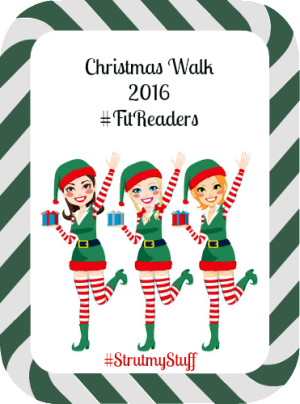 Using the comment section, leave your name and what you did for your #ChristmasWalk. Once you have completed your walk (or other exercise) and completed your check-in, there will be an awesome award badge for you to download, and you can display it with pride. Meanwhile, feel free to repost this graphic and instructions on your own blog/website. I’ll be talking about it until the day for the #ChristmasWalk. Another week already?! This week went by so quickly. And holy wowza… we are only ONE WEEK UNTIL CHRISTMAS! *phew* Panic is over. I’ve been keeping busy, and getting in my steps. I’m looking forward to having over a week off during the holidays and hosting my folks for a visit. Mom will walk with me and keep me going. I’m going to bring her to Body Flow, too. I’ve been getting in a little bit more walking time because I’ve been listening to some great audiobooks. Two books, from one of my favorite series, just came out on audio, and I love having the chance to “reread” both London Bound by Jessica Jarman and Drawn That Way by Bronwyn Green. I’ve also just started The Deal by Elle Kennedy on audio, and I am thoroughly enjoying it! Good books make for more steps!! * I track two different goals. The first goal is a timed duration of exercise – moving with the intent to raise my heart rate and get in some cardiovascular work. This is what I’m mean when I say “45 minutes walking.” The second goal is total daily steps. This is from my Fitbit, which measures all steps from 12:00AM – 11:59PM, exercise included. It’s not too late!! Don’t forget to SIGN UP FOR DECEMBER! and commit to exercising for the month. Sign ups from October through December will be at That’s What I’m Talking About. How was your week? Did you hit any milestones? Try a new food or workout? Celebrate your week with us! I can’t believe we are only a week from Christmas. I love when an audiobook is so good that you find ways to keep listening. I tend to get extra cleaning done, since I listen while I clean. I even wear DH’s noise canceling headphones while I vacuum. My house gets extra clean when I have a good audiobook. Thanks! I keep managing to get in my steps. Although right now it’s super windy and freezing outside and I’m avoiding walking! Eep! Thanks for checking in! Hope we see some cat in the Christmas Tree pictures!! Thanks! I know what you mean about the warm weather – however, it got chilly this weekend!! Even later checking in this week lol. Yay look at all that walking! If it weren’t for Audiobooks I’d have done no reading the last 2 weeks … love them! Hoping to drag my partner and Bella out for an early Christmas walk, the fam won’t be over til lunchtime. And with the time difference, you’ll have completed your ChristmasWalk before I go to sleep on Christmas Eve!! Enjoy!! Great job this week! Have a wonderful time with your family and Merry Christmas! I’ve eaten 5 pieces of homemade peanut butter fudge today. And I can’t even begin to say how much I ate over the weekend! Merry Christmas to you!! Late check in, it is going well enough. I am raking your advice to keep moving when I feel sluggish, or hit the treadmill for twenty. I am procrastinating wrapping presents. Thanks Gayle! Keep moving! Although I’ve been a lump today. I guess we’re all allowed that sometimes!